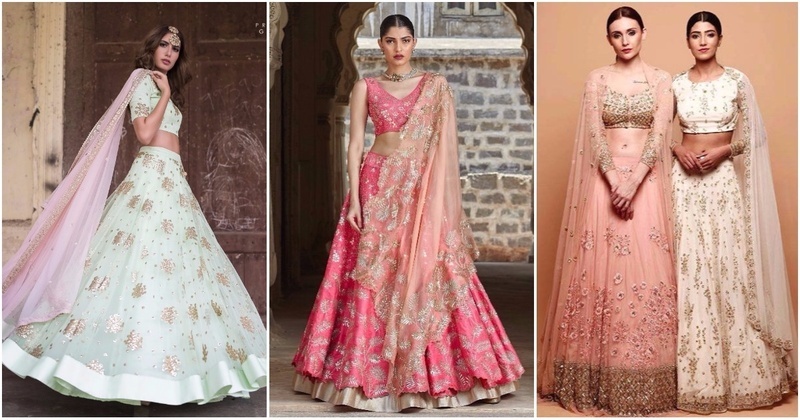 5 Amazing Lehenga Designers To Check Out This Wedding Season! Jade by Monica and Karishma has a distinctly global feel which is a reflection of over a decade of experience in international fashion. Their ability to create timeless pieces representing the traditional Indian crafts and heritage in a distinct and refreshing new avatar for today’s global woman sets their creations apart. 'Astha Narang' is all about chic, couture and simplicity. It targets new-age bold women. Pleats and folds are the forte of the brand which is combined with indian handwork. The texture of fabric integrated with pattern making and Indian textiles create classic and high-end silhouettes that target a trend conscious market. The label-MONIKA NIDHII is involved in painstaking hand embroideries, attention to details and fabric development, which are significantly based on Indian artistry. The collection is a blend of vintage elegance and new luxury. It has profusion of Indianness like intricate zardozi,chikankari, gotta-patti, kundan embroidery creating a mesmerizing effect with swarovski crystals and semi precious stones. A reflection of the latest trends and styles to give you that classic Indian look. Their customisable collection of traditional wear invites you to give design inputs. Their couture line ensures that you never ever have to look around the room to check if anybody else is wearing the same outfit. Since its inception in 2013, the Prathyusha Garimella label has carved an ethereal niche for itself, complementing the aesthetic aura of royal allure. Her designs are a blend of contemporary silhouettes with intricate detailing using sequins, zardozi and Gota Patti. They are cynosure pieces created in pastel hues, the label's salient and tres chic forte.